April 1 is tomorrow and I’m sure most of us know what that means. But the thing is who needs April Fools’ Day now, when it seems like idiocy and absurdity are around us all the time in the world? Paraphrasing a comment I saw on an online forum about a Southeast Asian country, I can extend it to the world and say it’s almost as if every day is April Fools. The most obvious example might be the UK and its ongoing Brexit mess. Despite the original deadline actually having just passed (April 29), the British parliament are still unable to decide what they want to do. Every day there is some kind of vote, which always fails, and the prime minister even promised to resign if MPs would support her bill, but even then she failed. The British parliamentarians can’t agree on whether to support Brexit, whether to hold an election, whether to have a full or a partial Brexit. It’s a little frustrating to me so one can imagine what lots of British people must be thinking. In the US, you’ve still got a joker in power but at least he’s not a Russian stooge, or at least there wasn’t enough proof. It hasn’t stopped Donald Trump from feeling even more confident and giving his enemies verbal jabs in bombastic speeches and tweets. In Hong Kong, the government has decided to solve the problem of inadequate public housing and supposed lack of land by building thousands of homes on new man-made islands in the sea. And it will only cost at least US$80 billion (HK$624 billion). Keep in mind this is Hong Kong, which boasts one of the world’s most pro-big business, pro-tycoons governments, and one would have to be dreaming to think that US$80 billion will be spent on affordable housing. With all this nonsense happening in real life, it’s going to be tough to come up with convincing April Fools’ stories. Talking to colleagues last week, maybe only something uncontroversial and banal would do like “UK leaders decide what they want for Brexit” or “Donald Trump says [something sensible]”. Leave a comment Who needs April Fools Day anymore? With days left until the end of 2017, it is with a lot of disappointment that I look back at this year and a lot of concern to the new year. The world is no less messed up than it was at the beginning of the year, and as if to underscore the point, December saw several major tragedies including a deadly train crash in the US, a massive mall fire in the Philippines, a tragic gym fire in South Korea, a mass shooting in an Egyptian church, as well as terrible fires in New York and Mumbai just this week. The Rohingya tragedy stunned the world when over 600,000 Rohingya were forced to flee Myanmar to neighbouring Bangladesh after a military campaign to destroy their settlements and kill Rohingya. It is a massive disappointment given how far the country had come from its authoritarian past in just a few years, and Aung San Suu Kyi went from a symbol of hope to one of disappointment and complicity to what many saw as genocide. But beyond human rights and the continued political theater of the US and Europe, one of the biggest developments in the West was a backlash against technology as people started to realize that not everything related to technology was positive. Not only does technology not solve everything, it can make things worse as with the proliferation of fake news and propaganda on social media. And worse yet is that the growing use of technology such as smartphones can have a detrimental and addictive effect on people. Major tech executives and insiders have spoken out about the dangers of tech and social media, going so far as to ban their own kids from using it. The growing glorification of tech in the past few years has seen tech entrepreneurs acclaimed as superstars, obscene amounts of money thrown into all kinds of start-ups, and “hip” companies acclaimed as vital disruptors of “staid” industries. The other big development in the West was a stunning wave of sexual harassment cases that started with movie mogul Harvey Weinstein and grew to include directors, actors, chefs, comedians, tech executives, politicians, and even a former US president. It seemed like every day brought some new story about a different famous person, even those who were previously admired or liked a lot, being accused of serious sexual harassment behavior. Taiwan saw a few serious protests during the year as the ruling DPP, under president Tsai Ing-wen, found it a little rocky when they implemented or backtracked on some tough measures relating to labour hours and wages and pensions. Internationally Taiwan continued to be bullied by China, which besides increasing military flights near Taiwan and making belligerent statements, lured Panama away to leave Taiwan’ official allies at 20. There are several other major tragedies elsewhere, such as Yemen and Syria (where civil war has raged since 2011), though at least ISIS has been defeated and in Europe the refugee crisis has improved from 2016. North Korea, with its childish madman leader, has kept on ramping up tensions, making nuclear war a growing, significant concern. This post is already quite long and I don’t want to keep going on about terrible events in 2017. But while it might appear that a lot of this world is falling apart or in danger of doing so, maybe this is a necessary period of turbulence before serious improvement (politically, economic, cultural, etc) can occur. With all that in mind, let’s look forward to the new year. Surely, 2018 can’t be worse, right? I would like to wish everyone a Merry Christmas and a great holiday season. I hope you have a good, festive time with family, friends, and have lots of things to be thankful for. It may have a tough year for some of us, but thankfully it’s coming to a close. Meanwhile, enjoy these photos of a couple of great mall Christmas decorations from a recent trip I made to Canada and Trinidad and Tobago. 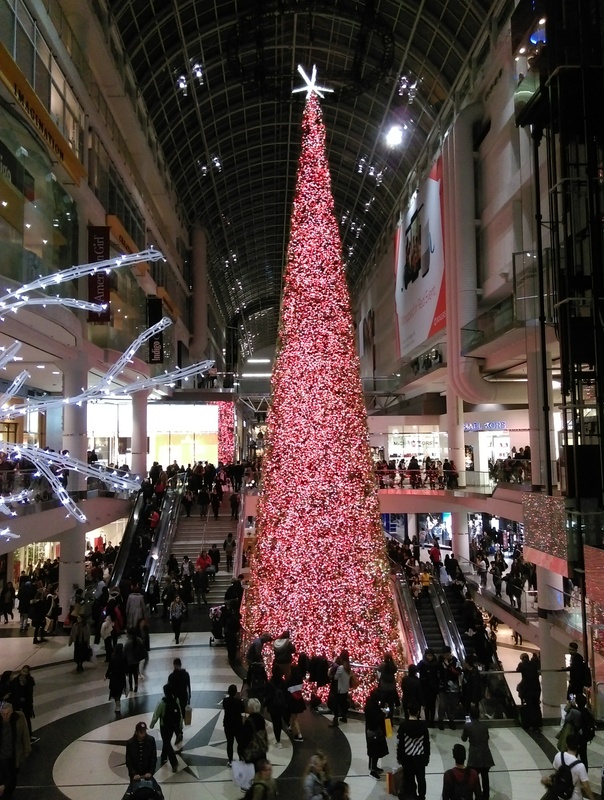 The towering Christmas tree in Toronto’s Eaton Centre was so nice I had to post it twice. 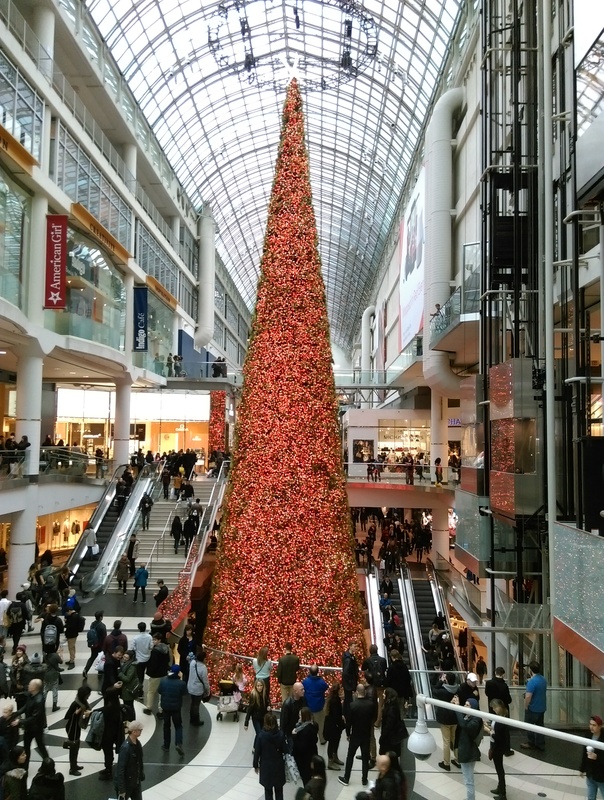 Actually I’ve never seen such a big Christmas tree before (its base is in the basement, which is two floors below where I’m taking it) and it was so tall it was almost scary. 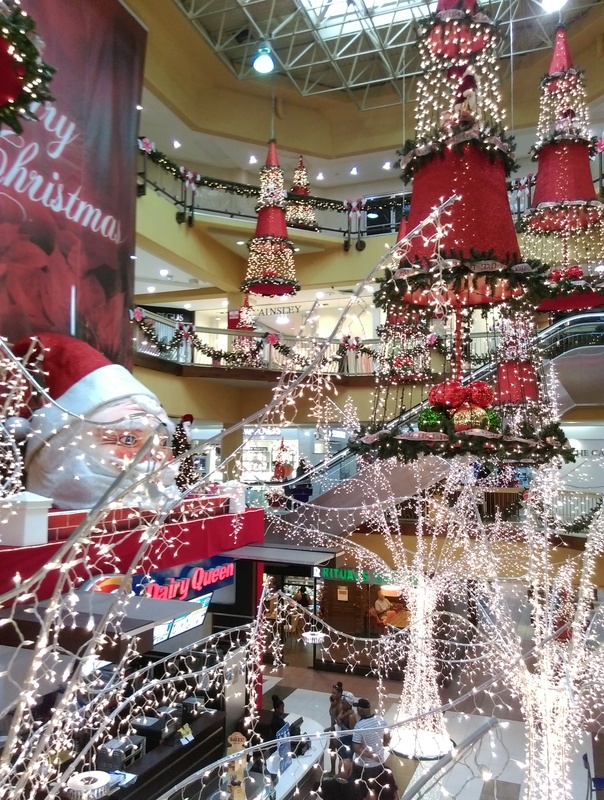 The other Christmas decoration is in Long Circular mall in Trinidad, the country where I’m from. Sometimes, there are certain essentials in life that get overlooked. Things like say, saving up money for the long term. Whether it’s due to being thought of as impossible (student loans, low salaries, unstable jobs etc) or the urge (driven by peers, advertisers etc) to live for the moment and enjoy life, being frugal isn’t easy to do or popular. But saving isn’t about being cheap, not having fun and missing out on life. That was an accusation I got from a relative when I mentioned that a lot of people in society don’t seem to save money — “well you hardly go out and never eat out,” she said, not without some rancour. That is not exactly true though I don’t have an overly active social life and I don’t spend much on meals and drinks – I usually get simple meals if I am eating by myself and I mainly drink only when I meet with friends (I do like beer and wine but I hardly drink alcohol at home). But the fact is that as someone who is completely financially responsible for himself, not to mention being well into my thirties, saving up is absolutely vital. Wherever I am and whatever my financial situation, I adjust my budget accordingly. Saving up also has a lot of benefits. First, who wouldn’t want to have money on hand for whatever you want to do or buy. Second, no matter how much people say to live in the present, being prepared for the future is important. You need to be prepared for medical issues, having a family, retirement, losing your job, etc. Third, savings isn’t just for going on trips or buying nice stuff, but also for essential but not-so-fun stuff. Things like dental treatment, and surgery, and family emergencies. For instance, I have a lot of issues with my teeth and have had surgery to remove crooked wisdom tooth and two root canals (I may need another one soon too!). Though I did most of this in Taiwan, where dental treatment is extremely affordable as most of it is covered by health insurance, getting a root canal and a crown is still at least US$400. Of course, in Hong Kong, the same would cost at least US$2,000! But the biggest benefit of saving money isn’t being able to afford good things or go on trips to different places. It’s not even the relative freedom of not having to put up with bad work situations for too long and being able to handle being jobless for a short period of time. It’s about being able to enjoy or endure these things and still have something left over. At the same time, I’m not an expert saver. I don’t keep track of my daily or regular expenses, I don’t make detailed spreadsheets, and I don’t go around counting pennies. —Use a mental trick to ensure you always have enough. When budgeting (as mentioned, I don’t keep regular tallies), always lower your actual budget. Basically, always imagine that your salary or the amount of money you can spend is a little less than what it really is. —Never spend every single bit of your money. And conversely, save up a little more than what you actually need for something. For example, if you need to buy a pair of shoes, and you budget US$120, feel free to spend less than US$120. If you need to buy something that’s US$500, save up $600 and hold on to that extra $100. Doing this regularly will ensure you’ll always have a little bit extra and it adds up, which is very helpful if unexpected expenses come up or if you want to spend a little bit more in future. —Pay off your debt (or as much as you can) as soon as you can, whether it be student loans (unless there’s no interest or it’s very miniscule), credit card bills, or even your mortgage. While a little debt might be unavoidable, it’s hard, both financially and mentally, to be dragged down by substantial debt that keeps increasing due to high interest. —Invest in something stable like pension plans or life insurance investment plans, which are popular in Hong Kong and Taiwan, early such as when you are in your late 20s. In the case of the latter, these plans take a number of years to become mature but they guarantee a significant return later on in your life. I’m no investment guru so do check actual experts and professionals for more insight and advice. That said, I would add never put all your eggs into one basket, and diversify your savings into different things like stocks, insurance, mutual funds etc. At times, it may seem as if the world is a farce, what with all the crazy political developments and societal mishaps. Except the problem is that this has long stopped being funny and people’s lives and livelihoods are at stake. The latest crisis in Asia is the ongoing standoff between North Korea and the US that hopefully will remain just that, without breaking out into nuclear war. While I really don’t believe that could happen, despite North Korea’s warning of “thermonuclear war” and a U.S. fleet deployed in nearby waters, it is still possible violent conflict can break out. Especially as the two key actors are a callous buffonish tycoon who leads the world’s most powerful country going up against a rotund tyrant whose cartoonish appearance masks the fact he heads one of the world’s most despicable regimes. Meanwhile, I know it is kind of old (last week) news but I’m still trying to get over the shocking scene from of an Asian-American doctor being dragged off a United Airlines plane bloodied and unconscious. When I first saw the news and hadn’t read all the details, I thought maybe it was a case of excessive force being used on a passenger who had done something violent. Instead, it turned out he did nothing wrong but had merely been chosen at random to get off because the airline had messed up and needed to squeeze four of its crew onto the flight. Because he refused, he earned the right to be forced from his seat, pulled violently towards the ground, thus knocking himself unconscious after his head hit a seat armrest, and dragged like a corpse through the aisle. What made it worse was that despite the clear video footage and multiple witnesses, the United CEO came out and made some boldfaced lies about the customer having been “disruptive” and “belligerent.” It took growing outrage from the public before the CEO was able to admit anything, in what were his third and fourth statements after the incident. Frankly, this is one situation where everyone involved from the security personnel who forced the victim out of his seat and pulled him out violently, rendering him unconscious in the process, to the airline crew to the CEO was wrong. You have to wonder what was going through the minds of those security men, who seem to have escaped blame given all the attention on the airline, when they did all that. “Just doing their job” isn’t a good-enough excuse. I don’t know, there’s an enormous lack of decency in society today in how we treat each other and what is scary is how much it permeates all levels, from top to bottom. 2016 has been a very rough year, with a lot of tragedies and shocks globally. Even as we’re in December, it still doesn’t feel like such a festive time, at least for me. There’ve been distressing developments in Hong Kong in the past few months, while terror attacks in the West and conflicts in the Middle East still continue. Nevertheless, we can still mark this special occasion, so to all of my fellow bloggers and readers, please have a Merry Christmas and a happy holiday season. Treat yourself and your loved ones nice, and be decent to people around you. 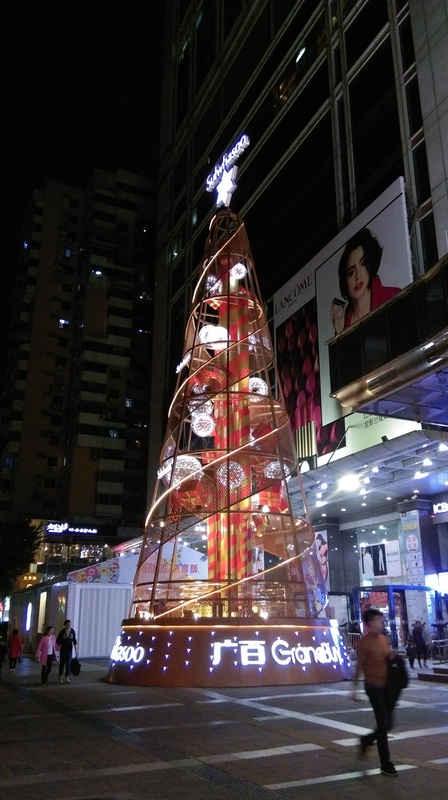 Enjoy the festive photos of Christmas scenes from Hong Kong and Guangzhou, where I did a weekend trip very recently. 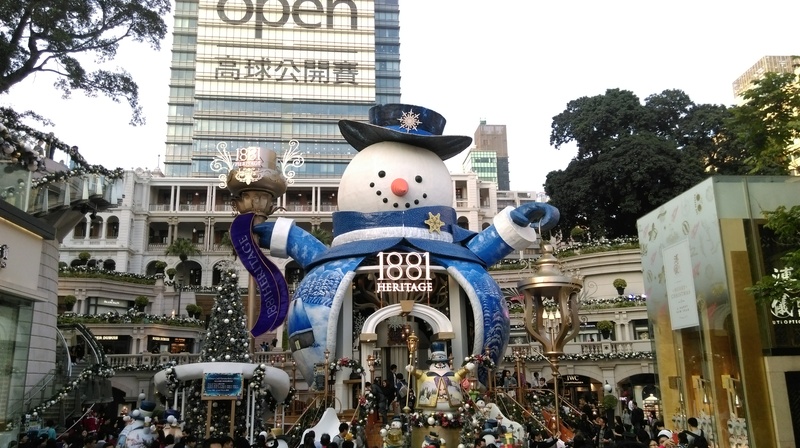 There’s no snow in Hong Kong but a giant snowman still looms over the entrance of 1881 Heritage, a 19th century colonial police headquarters that has been renovated into a luxury shopping center. The two photos above are of Hong Kong while the two below are from Guangzhou. 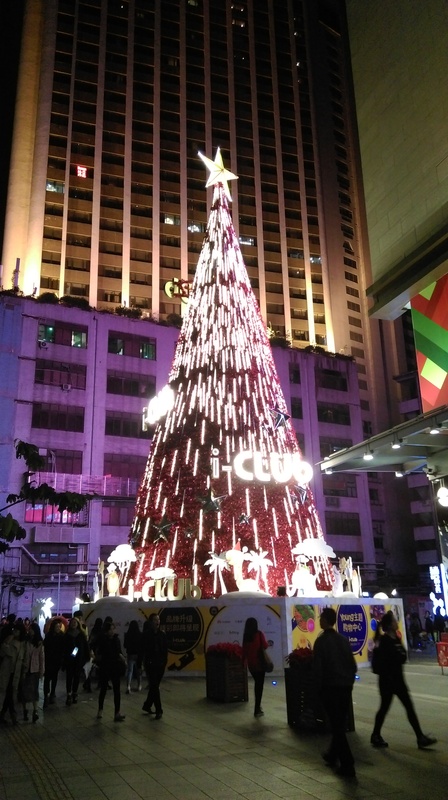 While Christmas is not a holiday in China, it is becoming a major occasion, in the big cities at least, mostly for decorations as you can see below, and for shopping. 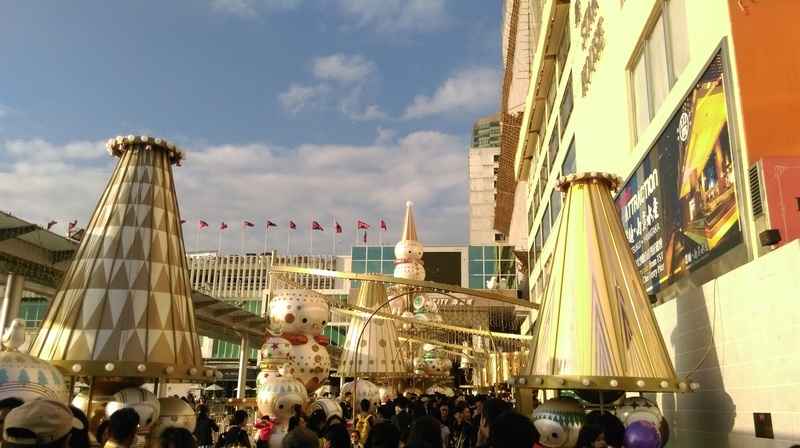 It’s also like that in Taiwan, where Christmas is not a holiday but stores and malls are decked with Christmas banners, trees and decorations, while staff even wear Santa hats.